Darrell Miller explains ArmyOneSource.com at Wednesday's meeting of Woodworks at Fort Leonard Wood. FORT LEONARD WOOD, Mo. (June 30, 2010) — Military personnel and their families have long lists of services and personnel available to help with a wide variety of personal and family issues, but the growing list is so long that many soldiers no longer know what’s out there to help. That’s a particularly serious problem for new servicemembers and spouses, so at Wednesday morning’s meeting of Woodworks, Army One Source staff member Darrell Miller spoke to representatives of major support organizations at Fort Leonard Wood on what his program can offer to help connect people with services they need. Located online at www.ArmyOneSource.com, the referral service has links and connections to many other programs and also provides some services itself, Miller said. That’s especially important for family members who choose to leave a military installation and go home to live with other family members when a soldier deploys, Miller said, as well as people in Army Reserve and National Guard units that may not be located anywhere near an Army installation. In a video presentation shown by Miller, Army One Source presenters said one benefit of providing a referral service via the Internet is it helps geographically dispersed military families including families of deployed soldiers who return home, leaving a military installation where services would be more readily available to help them. The internet service, a subsidiary of Military One Source, is available 24 hours per day and one of the most commonly used features is that it provides details on health care. 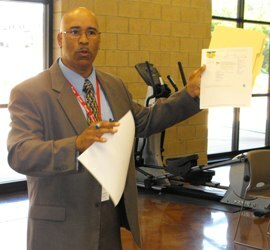 Locally at Fort Leonard Wood, Miller said the spousal employment program is a good example of how Army One Source works. “They’ve helped thousands of spouses of military members find work,” Miller said. Other programs include online tutoring for military children. “If you have kids it’s great; they help you in like 16 subject areas. It’s really a great tool, and please take a look at it if you have kids or are going back to school yourself,” Miller said. One audience member, Stephanie Leary, had a question about why a website intended to help family members isn’t as accessible as it could be. “I’m wondering why they tell people to go to ArmyOneSource.com instead of MyArmyOneSource.com when it takes you to MilitaryOneSource.com. That’s just adding a click and they say consumers should only have to make three clicks to get where they want to go,” Leary said. “I know that didn’t really clear it up for you, but I’ll check,” Miller said.